Soluble K-humate (Granulated) is a solid soil conditioner formulated to increase the ability of soil to retain nutrients and improve water-holding capacity. K-humate (Granulated) enhances the soil’s ability to chelate nutrients and to promote exchange of nutrients between plants and the fertilisers being applied. K-humate (Granulated) is a concentrated soil conditioner formulated from plant derived natural deposits of Australian Leonardite sourced from Victoria’s Gippsland region in Australia. For use with agricultural and horticultural crops, fruit trees, flowering plants, turf and pasture. The most concentrated form of humic acid available. K-humate S100 (Granulated) dissolves rapidly in water (100% soluble). Suitable for all irrigation and fertigation systems. K-humate (Granulated) is suitable for agricultural and horticultural crops, fruit trees, flowering plants, turf and pasture. K-humate (Granulated) can be conveniently applied in conjunction with agricultural lime and conventional fertilisers like Urea and Superphosphates to maximise the efficiency of these fertilisers. For greater effect, K-humate (Granulated) can be mixed with conventional fertilisers before application. Also suitable for direct application in a liquid form or mixing with soluble fertilizer formulations. 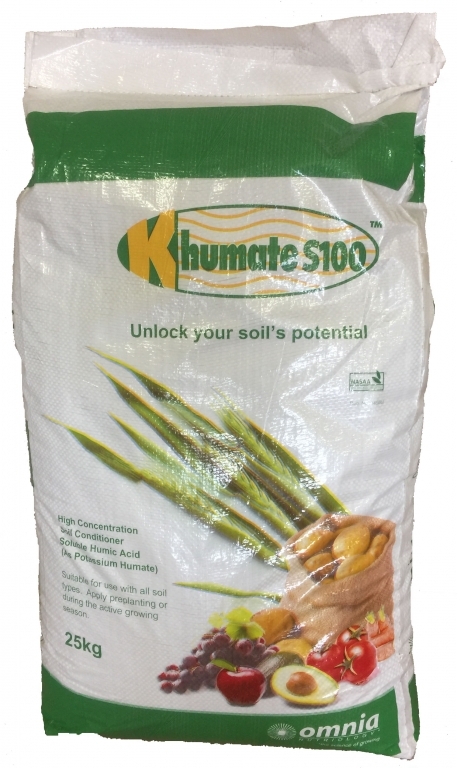 K-humate S100 is a NASAA-Certified organic product of choice.